2019 Bay Area Principals' Institute Launched! On Friday, March 8th, 2019, a group of school principals, school district leaders, and public agency staff met in San Francisco at the headquarters of the San Francisco Public Utilities Commission for the first seminar of the 2019 Bay Area Principals’ Institute. First offered in 2016, the Green Schoolyards America Principals’ Institute supports school administrators in their pivotal role as leaders of their school community and champions of a healthy and dynamic school environment. Over the course of this year-long program, our staff will provide resources, advice, and professional development to support participating principals and school district leaders in adopting and sustaining comprehensive, high quality, green schoolyard programs at their schools and in their districts. Through the Institute’s seminars and schoolyard learning walks, participants will also develop connections and relationships with other professionals in their own districts and beyond, who can help support their green schoolyard work. The 2019 Bay Area cohort includes three local school districts, as well as a number of independent schools in the area. Our program also often includes participants from partner agencies and nonprofit organizations. We have already seen results from the connections made on the first day of this year’s program and we look forward to growing this network and “community of practice” as the Institute progresses. Over the course of the year-long Institute, we will cover a wide range of green schoolyard topics focused on the question of how to make the most of school ground land for PreK-12 students’ learning, play and health, community engagement, and ecological resilience. 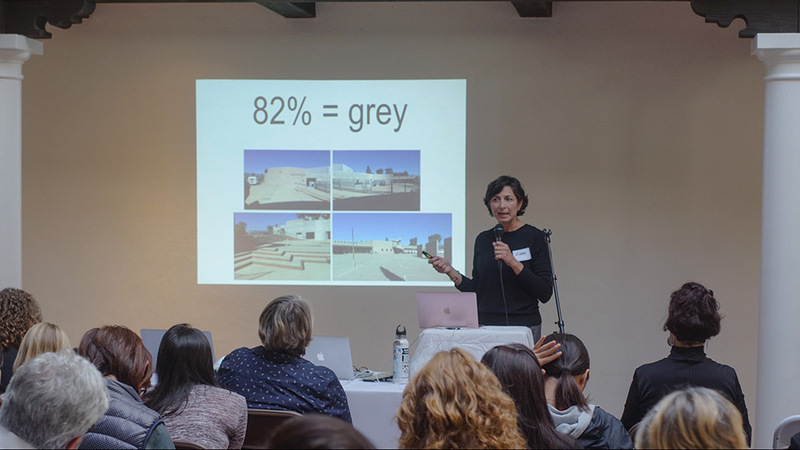 Sarah Bloom, a watershed planner with the San Francisco Public Utilities Commission, gave a presentation about stormwater schoolyards during the first Seminar of the 2019 Bay Area Principals’ Institute. Our first seminar on March 8th provided an overview of the green schoolyard field and introduced participants to the multitude of benefits that can be achieved by greening school grounds. Our CEO, Sharon Danks, shared inspiring case-studies from around the world and current trends within the global movement. Our Program Director, Dr. Raymond Isola, provided insights and examples of how schoolyard greening works in practice, from his own experience as an elementary school principal in San Francisco. SFPUC Watershed Planner, Sarah Bloom, gave a lively presentation about how greening school grounds and removing asphalt helps the SFPUC to manage San Francisco’s urban watersheds. During the last part of the day, our Program Manager, Erica Fine, led participants through a number of exercises to help them assess their own school grounds and existing policies and programs, to better understand the opportunities for green schoolyard improvement. This work will serve as the foundation of their individual green schoolyard projects, which help participants to apply what they learn to their own contexts. 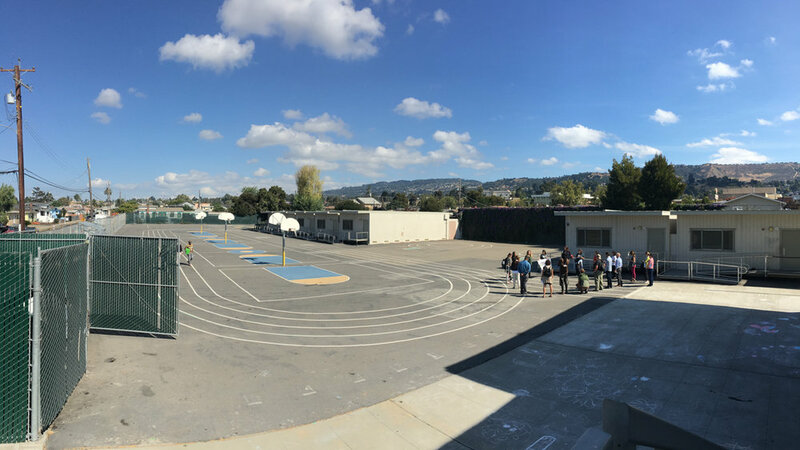 The next seminar for our Bay Area Principals’ Institute cohort is May 3rd, and will focus on how to use school grounds to improve health and well-being. In the meantime, we look forward to touring local school grounds with our participants to see examples of what green schoolyards look like on the ground. Enrollment is now open for our 2019-2020 Principals’ Institute cohort in the Los Angeles region. Click here for more information about how to sign up! We are grateful to our sponsors and partners for supporting the 2019 Bay Area Principals’ Institute! 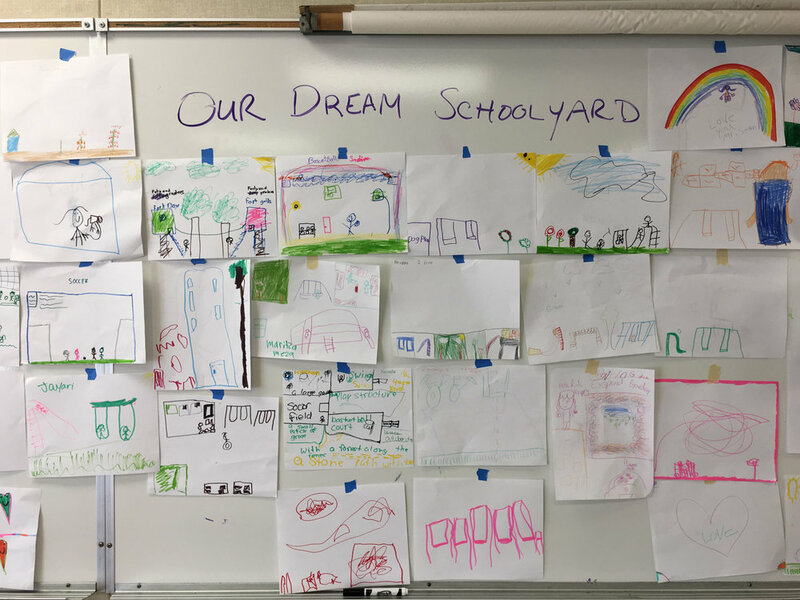 If you or your organization are interested in supporting our Bay Area or Los Angeles Principals’ Institutes, please contact info@greenschoolyards.org. Two thirds of the playgrounds in Philadelphia don’t have a playground, and many look like this: acres of asphalt, very little shade, and cars parked where children could be playing. Philadelphia, PA – Green Schoolyards America’s CEO, Sharon Danks, traveled to Philadelphia on February 15th to join radio station WHYY and the local community in a conversation about the need for more playgrounds at Philly’s schools. More than 100 community members gathered for a lively event that included dinner, presentations, and a discussion. Research conducted by WHYY’s journalist Nina Feldman uncovered the fact that two-thirds of Philadelphia’s public elementary schools don’t have playgrounds, and that the presence of playgrounds is highly correlated with income levels of each neighborhood. The lower income areas of the city do not have playgrounds, leaving children to play as they can on unimproved, unshaded asphalt that often doubles as parking space during the day—as shown in the photograph above. WHYY’s Nina Feldman (left) interviewed local resident Antoinnette Reynolds about the need for more children’s play space in her neighborhood. During the event on February 15th, Feldman interviewed a grandparent (above) and her children about what the lack of playground space means for her family. Danks gave a presentation about the benefits that green schoolyards afford in other cities,, and advocated for greening school grounds in Philadelphia to provide improved learning and play spaces that will connect children with nature on a daily basis and offer a wide range of health benefits. Philadelphia School District Director of Capital Programs, Danielle Floyd, also spoke about the school district’s budget realities and their hopes for being able to improve playgrounds across the District. Feldman then led a panel discussion with Danks, Floyd, and Plan Philly’s Managing Editor, Ariella Cohen, to discuss the future of building more playgrounds in Philadelphia. We hope that this conversation and the high level of interest expressed by the local community will spark a shift in the way that the Philadelphia School District uses its grounds in the future. For more information about this event and WHYY’s recent reporting about playgrounds in Philadelphia and San Francisco, please follow the links below. The community gathered in the Olney neighborhood of Philadelphia for a conversation about the future of playgrounds across the city. Oakland, CA – On Wednesday, February 13th, the Oakland Unified School District’s Board of Education passed two complementary policies that will take the District down a path toward ensuring OUSD students are educated in greener environments and become environmentally literate and prepared to address the challenges of the future related to climate change. The Development of Living Schoolyards policy outlines OUSD’s vision to transform asphalt covered school grounds into living schoolyards that promote children’s health and well-being, while creating green and ecologically rich community parks that connect children and their neighborhoods to the natural world outside their classroom door, every day. The policy also provides a roadmap for implementing this plan, to create a successful transition to implement living schoolyards in all schools across the District. The Environmental and Climate Change Literacy policy acknowledges that climate change is the “greatest challenge facing future generations,” and commits the District to integrating climate literacy into the curriculum by providing resources and training to teachers. 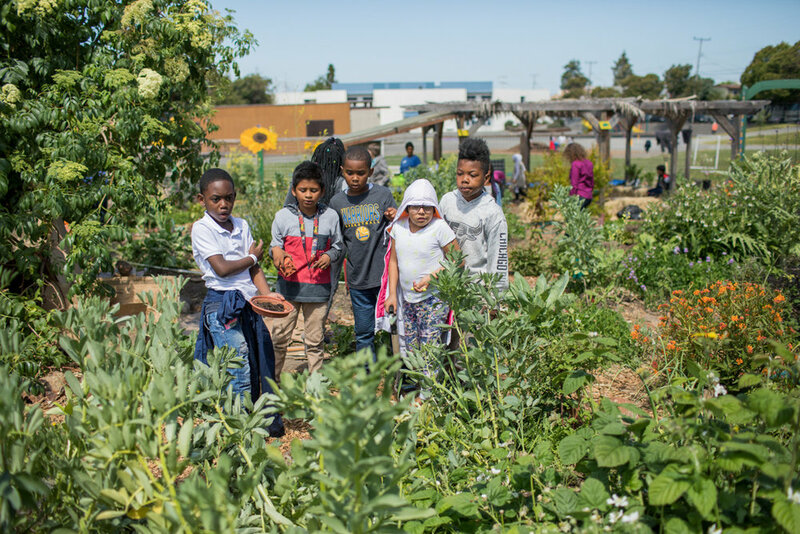 The Policy encourages OUSD to align its curriculum with state standards and provide action-oriented projects that help create schools that can be sustainability hubs for our communities. Simultaneous to working on the policy, The Trust for Public Land is leading the implementation of living schoolyard pilot projects on five campuses: Melrose Leadership Academy, Markham Elementary School, the co-located International Community School and Think College Now, Street Academy, and Ralph J. Bunche High School. The Rose Foundation is creating a living schoolyard at the Havenscourt Campus. “The Trust for Public Land works to ensure that everyone lives within a 10 minute walk of a park, and Oakland schoolyards have the potential to move the needle on addressing this vision. Our organization is committed to working with the District and the Oakland community to design and build living schoolyards, as well as assisting the District to develop policies and strategies and secure funding to ensure that projects are implemented and maintained,” said Alejandra Chiesa, Bay Area Program Director for The Trust for Public Land. These schoolyard transformations have been successful in attracting funding from State and philanthropic grants. The Trust for Public Land has recently secured close to $2.3 million dollars in state grants and additional funding in private philanthropy from the Hellman Foundation and Kaiser Permanente Northern California. Green Schoolyards America’s mission is to transform asphalt-covered school grounds into park-like green spaces that improve children’s well-being, learning, and play while contributing to the ecological health and resilience of our cities. We seek to change the norm for school ground design, use, and management so that all children will have access to the natural world in the places they already visit on a daily basis. For more information, please visit www.greenschoolyards.org. 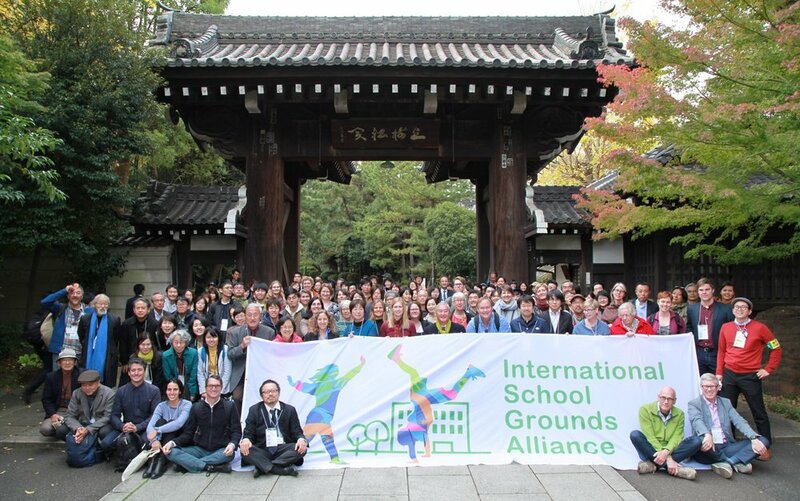 Conference participants at the International School Grounds Alliance’s conference in Yokohama, Japan. One of Green Schoolyards America’s closest partners is the International School Grounds Alliance (ISGA), a global network of organizations and individuals working to enrich children’s learning and play by improving the way school grounds are designed and used. Every year or two the ISGA holds an international conference in a different part of the world. 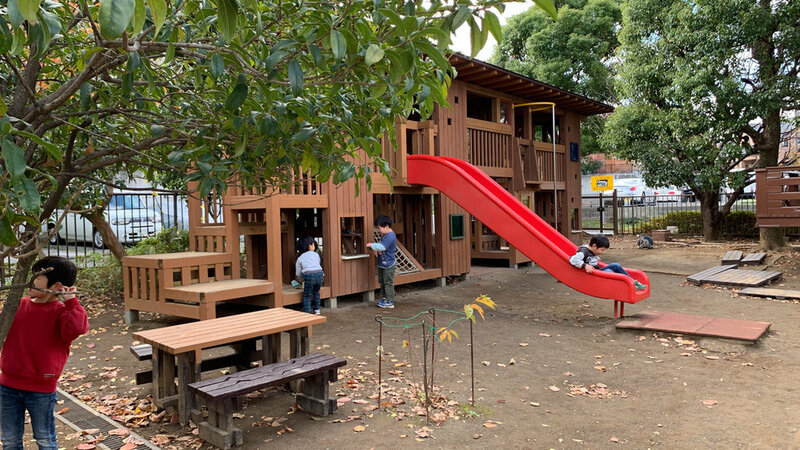 In November 2018, the ISGA’s 7th conference was held in Yokohama, Japan and was directed by Dr. Ko Senda, Associate Professor at Tsurumi Junior College (and in our opinion, one of the best designers of children’s environments in the world!). The conference was called Exploring the World through Our School Grounds. Green Schoolyards America’s CEO, Sharon Danks, is one of ISGA’s co-founders. She participated on the conference planning committee and was honored to share our work in Japan during the event’s international symposium. 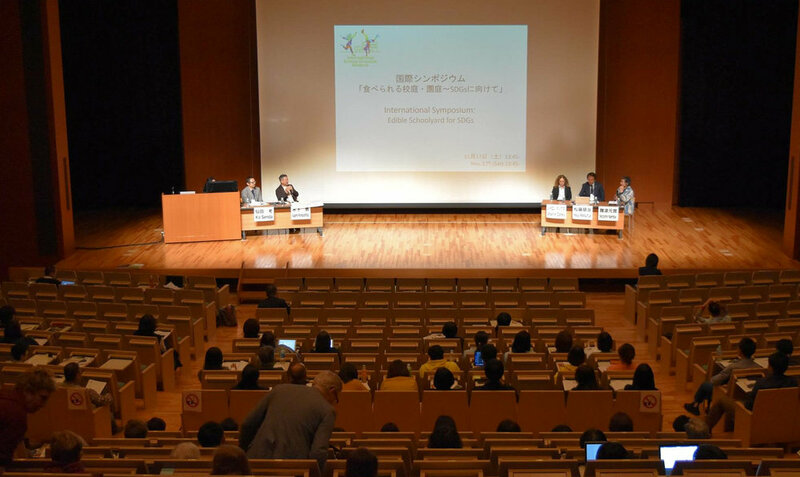 Sharon Danks shared Green Schoolyards America’s work at the international symposium in Japan. During the conference, participants were treated to inspiring keynote talks, workshops, and tours and spent time with colleagues from Japan and many other countries. The schoolyards that participants toured were absolutely phenomenal, and included preschool environments where hundreds of children engage in hands-on learning and play by climbing trees, swinging on ropes, digging in sand boxes, and balancing on creatively-designed play elements. Preschool children play in the lush and exciting green schoolyard at Miyamae Kindergarten in Japan. Preschool children at Miyamae Kindergarten explore an area of their school grounds that includes a variety of challenging tree houses and forts built in and among a small forest grove on a hillside. At many schools, the buildings—as well as the grounds—were designed in a very child-centered manner that included rope climbing nets and other interactive elements that were built into the structure of the school buildings, giving children a very three dimensional experience of their classrooms and gathering spaces inside the schools. Conference participants explored the multi-purpose room at Yotsukaido Satsuki Kindergarten in Japan, designed by Environment Design Institute. This beautiful gathering space includes playful elevated catwalks around the perimeter, a rope net tunnel across the ceiling, and a whole wall that opens up on days with nice weather to create an indoor-outdoor performance space. A view of the autumn landscape at Akitsu Elementary in Japan. The green schoolyard at this school includes a large rice paddy, a wetland/pond ecosystem, shade trees, fruit trees, grassy play spaces, rolling hills, group seating, and parent-built play elements. A custom-designed play environment at Kohoku Kindergarten in Japan nestled in the trees invites children to explore, climb, slide, and create their own games in and around this unique play structure. At the conference, Susan Humphries (center), who was the principal of The Coombes School in England for more than three decades, received a lifetime achievement award for her work as a pioneer in the global green schoolyard field. She is shown here with six members of ISGA’s Executive Committee from the USA, UK, Sweden, Canada, and Japan. Green Schoolyards America greatly values our relationships with like-minded colleagues and organizations around the world. Their thoughtful, elegant, and impactful work continually enriches our overall approach and broadens our perspective. We are honored to partner with the ISGA to build an international movement in this field, and to add our voice to a wider call to connect children with nature every day at school. The ISGA’s next conference will be held in Scotland in September 2020. We hope you will join us and add your voice to the growing global chorus of green schoolyard advocates! Please visit the ISGA’s website for more information. 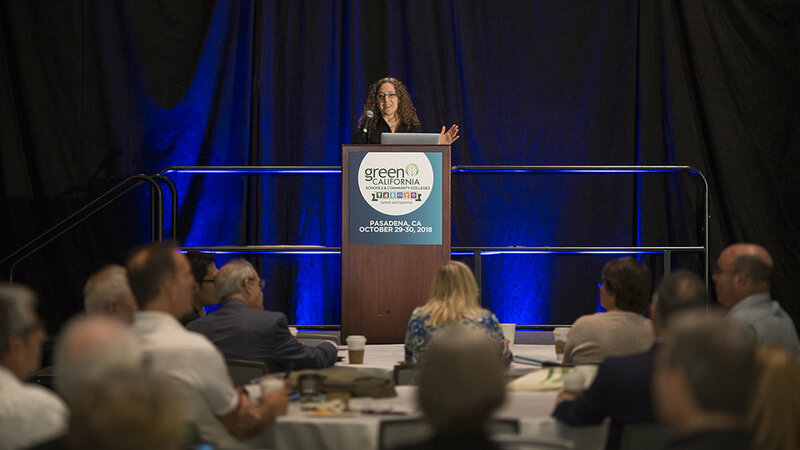 Sharon Danks (Green Schoolyards America) gave a keynote presentation at the Green California Schools and Community Colleges Summit this year. Photo by David McNew, courtesy of Green Technology. For more than a decade, the Green California Schools and Community Colleges Summit has been an annual gathering place for the green building community to share ideas and best practices, launch new programs and products, and work to shape the future of the green building field in California. This year, Green Schoolyards America’s CEO, Sharon Danks, was honored to give the keynote address on the opening day of the conference. This was particularly exciting because the green building industry has long focused on constructing school buildings, and has only recently begun to seriously consider how school grounds can impact the local environment and influence children’s health and experiences at school. All children have daily access to nature right outside their classroom door, enabling dynamic hands-on learning across the curriculum, child-directed play, robust health, and a positive social environment. School grounds are vibrant, welcoming centers for their communities, and the public lands managed by schools also function as public parks after hours. School grounds act as green infrastructure for their cities, helping to foster healthy urban watersheds, rich wildlife habitats, improved climate, and better air quality. Sharon also presented the contrasting, stark reality that many school grounds in California face: A majority of our schools are almost completely paved and lack trees and other vegetation. 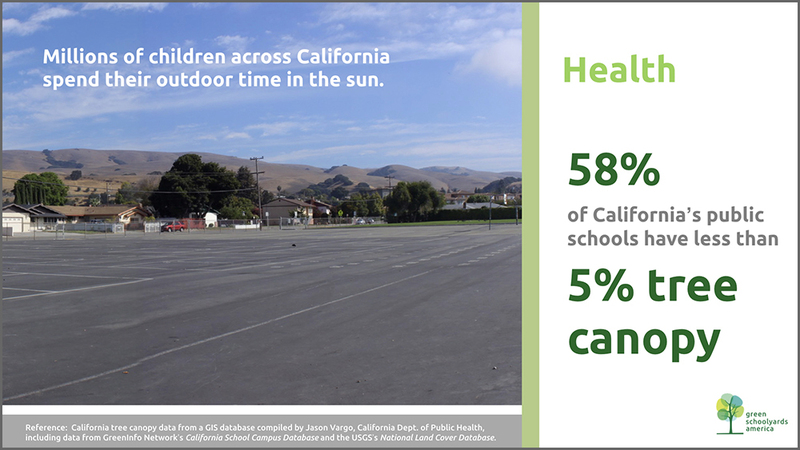 More than 58% of California’s public schools have less than 5% tree canopy coverage to protect children from the sun, and cool our urban environment. The need for change is clear—as shown in the image below—and the scale of making a transition from “asphalt to ecosystems” on our school grounds is enormous. California has more than 10,000 schools on 130,000 acres of land. We need widespread collaboration to move the needle on this problem. Sharon Danks included the slide above in her presentation at the Green Schools Summit. ©Green Schoolyards America, 2018. Sharon encouraged the audience to do what they can, in their own roles, to help fix this problem and shift the norm for schools across our state so that all children will have access to nature on their own school grounds, every day. She also presented specific ideas to help the architects, public agency staff, and school district leaders in the audience get started, and encouraged interdisciplinary collaboration to move the field forward. For more information about Green Schoolyards America’s approach and philosophy, click here for an interview with Sharon Danks that the Summit host conducted in preparation for this event. Workshop organizer, Claire Latané, opened the program. On Thursday, October 11, 2018, Green Schoolyards America’s CEO, Sharon Danks, was honored to participate in an innovative workshop called Designing Schools for Mental Health. The workshop was led by our colleague Claire Latané, and was hosted by the Cal Poly Pomona Department of Landscape Architecture. The goal of the event was to convene members of the mental health, education, design, and environmental communities in the Los Angeles region to share their work and spark a discussion about how all of these fields can collaborate to create school environments that better support students’ mental and physical health and well-being. Keynote speaker, Dr. William Sullivan from the University of Illinois, spoke about his research that connects landscape design to children’s well-being. He and his colleagues have found that views of trees and green landscapes from the classroom window reduce students’ stress levels and restores their ability to pay attention, helping students to measurably improve their academic performance. Sharon Danks, Green Schoolyards America, shares our organization’s vision and perspective. Dr. Marcella Raney (Occidental College) discussed her recent research that illustrates connections between schoolyard design, children’s behavior patterns, and their physical activity levels. Eileen Alduenda (Council for Watershed Health) spoke about her organization’s research into the land use patterns and tree canopy coverage of school grounds in the Los Angeles Unified School District—and their shocking findings that ~20% of LAUSD’s school grounds are completely paved and don’t have a single tree. Pia Escudero and Albert Grazioli, speakers from LAUSD, also detailed the school district’s work to provide an expanded network of wellness centers and mental health services to the District’s students. Maryjane Puffer (LA Trust for Children’s Health) spoke about her organization’s work to improve children’s health. The event concluded with lively group discussion sessions designed to encourage ongoing collaboration to improve children’s mental and physical health at schools and districts in the region. Eileen Alduenda, Council for Watershed Health, explains that a shocking 82% of LAUSD’s school grounds are paved. Recently, at an event co-hosted by The Presidio Trust and Green Schoolyards America, the featured keynote speaker, Laís Fleury, Director of the Alana Institute in Rio de Janeiro and the Coordinator of the Children and Nature program in Brazil, shared how one organization is working to connect children with nature in Brazil. The event was held in celebration of International School Grounds Month, with the collaboration of the International School Grounds Alliance (ISGA) and Evergreen. In May, we were fortunate to be able to host Cam Collyer, Executive Director of Programs for Evergreen, a Canadian charity that is “Inspiring action to green cities,” to share his insights on working with the staff who manage and care for our schools' facilities and grounds on a daily basis. Nancy Striniste, founder and principal designer at Earlyspace, is a landscape designer and former teacher. In the guest blog below, she gives us a peek into how one public charter school is using their green schoolyard. This new publication is an expanded version of the school ground Activity Guide we have been producing over the last few years. It is designed to help schools use their grounds to the fullest during the month of May (for International School Grounds Month and Living Schoolyards Month) and year round! Green Schoolyards America and The Presidio Trust invite you to join us for an inspiring afternoon presentation and discussion with our visiting keynote speaker, Prof. David Sobel, who will talk about the importance of nature play for 21st century children. Sharon Danks has been invited to speak in Tokyo, Japan on August 4, 2016 at a meeting of the Japan Society of Urban and Regional Planners. Shunji Suzuki, a member of the JSURP board, is hosting the event. Semestre de Primavera: Animales en el Jardin! Green Schoolyards America is proud to feature Living Schoolyard Month celebrations that were held in May across the state of California. This post was written and photographed by Joanna Johnson of Education Outside in San Francisco, California. It is available in Spanish and English! Join us in Sacramento on May 18th! The State Water Resources Control Board is hosting the STORMS Seminar Series to share the latest reports, studies, and policies in the world of stormwater to an audience of both governmental and public interests, as a way to support their mission of promoting stormwater as a valuable resource. The next STORMS Seminar Series event, Living Schoolyards for Stormwater Management, will be hosted at the CalEPA Building (1001 I Street) on Wednesday, May 18th, 10 am to noon. Announcing three new Activity Guides! Together the three Activity Guide publications include a total of 147 activity ideas from 123 organizations! We hope that you will use these free resources to take full advantage of your school grounds in May—and throughout the year! Join us for a Free Presentation in Petaluma, California! Please join us for an inspiring slideshow about the ways in which innovative school districts around the world are using their land to create engaging, educational spaces for children while also improving the local environment. Green Schoolyards America featured in the Mountain View Voice! California’s climate action law (AB32) includes an innovative market-based mechanism to lower greenhouse gas emissions called “cap and trade.” The California Air Resources Board, in collaboration with a number of state agencies, is organizing investment strategies for the next three years. In the first draft investment plan, schools were not included as investment priorities and were not eligible for most of the funding programs. Today, December 17th, Katrina Ortiz from Green Schoolyards America and Deborah Moore from Green Schools Initiative spoke at the California Air Resources Board’s public hearing about their 2016-19 second draft investment plan. We’re happy to report that we now have 26 Midwest organizations on board to contribute activities to the 2016 Living Schoolyard Activity Guide - Midwest Edition! We’re glad that so many amazing organizations from across Wisconsin, Illinois, Michigan, Indiana, Ohio and Iowa have joined us so far. We’re looking forward to including more voices in the coming weeks! As you may have heard, we’re in the midst of raising funds to make sure we are able to complete this guide—and we need your help!